Think about the hassle of continually getting out of your car to open your gate. You know the drill— get out the car, open the gate, get back in the car, and drive a few feet only to get out again to close it back up. It’s not the best way to start or end your day, especially if you factor in heavy rain and snow. Fortunately, the solution is simple—you can install a gate opener. An automated gate opener will solve this constant inconvenience. It’s a time saver, too. More important than any of these reasons for buying a gate opener is the layer of security that it adds to your family and property. It means that you don’t have to leave a child alone in the car while you fumble with your keys to open or lock the gate. You don’t have to expose yourself or your unlocked car to unnecessary risks. The buyer’s guide below will help you find the best gate opener for your home, including various automation and remote access options that are currently available. Finding the right gate opener starts with knowing the type of gate you own. If you don’t have a gate yet and are planning to install one with an automatic gate operator, you must consider the design and specs of both items so that they’ll work together without a hitch. What type of gate do you have? Swinging gates – have one or two panels that swing open like a door. Sliding gates – are made of one or more panels that slide to one side. Most sliding gates are supported on the ground by rollers that slide along a rail. A special sliding gate type—called cantilever sliding gate—doesn’t touch the ground and is instead supported by two gate roller posts on one side. The sliding panel is 50% longer than the opening to provide the counterbalance or anchor that the gate needs to operate as a cantilever system. Single-swing gates – have one panel that opens to the side; can be opened using swing arms (either top or bottom swing arms) or ram arms (also called linear arms). Dual-swing gates – are also known as bi-parting gate or double-leaf gates. They have two panels that open from the middle of the gate and can be opened using a pair of swing arms or ram arms. Single-panel sliding gates – have a single long panel; can either roll on the ground with carrier wheels on a guide rail or work as a cantilever with roller posts. Most sliding gates are of this type. Multiple-panel sliding gates – have two or more telescoping panels, which may roll on parallel rails or work as cantilevers. This type is commonly used for gateways with unusually long spans. The specifications of a gate opener include the maximum length or weight of the gate that it is designed to operate. The gate’s actual length (in feet) and weight (in pounds) should be less than these limits. IMPORTANT NOTE: If the specs state that a gate operator works for, say, a gate up to 20 feet long or 900 pounds, it doesn’t mean that it will work for a gate that’s both 20 feet in length and 900 pounds in weight. There’s usually a diagram or table specifying the maximum weight for a corresponding maximum length, so make sure that you have this information. What power source do you intend to use for your automated gate opener? The motor and circuitry of gate openers may run on alternating current (AC – electricity from the mains), direct current (DC – electricity from batteries), or solar power. AC-powered gate operators are more powerful than other types. They’re generally used for gates of commercial establishments, though you’ll have no problem using them for residential purposes. If you plan on using AC power, consider the distance of your gate from the power source, since distance causes substantial power drop. DC-powered gate openers are suitable for residential use or as backup power for AC-powered commercial gates. Most recent models, however, are mainly DC-powered with options to charge using either AC or solar power. As to solar-powered gate openers, more and more manufacturers produce models that are powered by solar energy. You have to know, though, that most models marked “solar-powered” are actually powered by DC but charged by solar panels. Solar power not only uses clean energy, but it’s also free. It is ideal for outdoor installations like a gate but may not work for all regions in the country. How do you want to access and control your gate? Card reader system – more commonly used in commercial establishments or residential complexes with multiple occupants. Mobile phone gate access system – smartphones, tablets, and other authorized gadgets can be used to activate the gate. Automatic closing system – with this feature, your property stays secure even if you forget to close the gate back. Vehicle detection loops – these accessories, also called inductive loop traffic detectors or exit vehicle sensors, are installed inside the property several feet from the gate. What other details do you need to know about a gate opener? Speed – refers to the speed of gate movement in feet per minute. Manufacturers may also express it as the total number of seconds that a gate uses up to fully open or close. Normal cycle or duty cycle – refers to the number of opening and closing cycles that a gate-opening device is designed to perform per day. A cycle is also measured as the time that the opening device works without overheating.Tip: For duty cycles designated as S2, 15 – it means that the motor operates on a short-time duty of 15 minutes, followed by a rest period to cool down then it’s ready to work again. Noise levels – quiet models operate at less than 56 decibels, which is equivalent to the sound level of typical conversations at home. What warranty does the manufacturer offer? Read the fine print to know whether or not your gate opening device has a warranty for manufacturing defects and accidents caused by defects in the device. Also, read reviews about how the manufacturer responds to complaints and requests for troubleshooting assistance. Compare warranties between products, and also inquire about extended warranties. Find below the best gate openers that made it to our Top 5 list. One of the best dual swing gate openers that you can get comes from Ghost Controls, a leading company in the automated gate industry. One of its core values is reliability, and that’s demonstrated well in their TDS2XP dual swing gate opener. This gate actuator handles 300-900 pounds of weight, depending on the length of the gate. The system operates on a 12-volt battery, which recharges using the solar panel that comes with it. Let’s see what else it’s got. 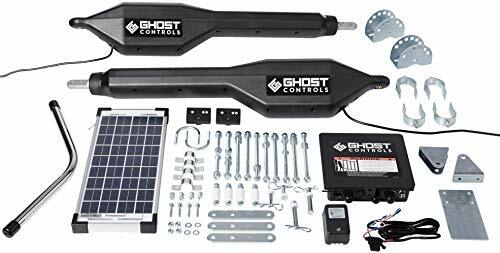 Kit includes all that you need for the installation – comes with the control arms, control board and circuitry, the solar panel, and all the hardware required for push-to-close gates. Easy to install and program – the manual contains clear instructions, and the online tech service is accommodating. There’s no welding involved. Upgrades for customization are available – an extensive product line includes auto gate locks, wireless keypads, and vehicle exit sensors. There’s no limit to the number of remote controls you can add to the system. The kit includes two remote controls – other control accessories are sold separately. The transmitters have long-range detection capability – remotes work from as far as 500 feet, depending on location and position of the receiving antenna. 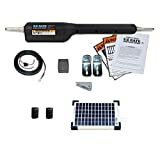 Comes with a solar panel – kit includes a 10W solar panel. You may add more panels if needed. Noiseless – it operates quietly, but you can enable the feature that produces beeps when the gate is about to open. UL 325-certified and ETL-listed – it has passed third-party safety standards for electronic gate operators. Works with HomeLink – it will work with the HomeLink control button of most car models from 2015 to the latest. Not intended for solid panel gates – it is designed for tubular, chain link, and plantation-style gates. You cannot use old remotes from other brands for the TDS2XP – for all wireless accessories, such as remotes, use only accessories from Ghost Controls. The same is true for the gate lock—you can only use Zombie Lock for the auto-locking system to work. 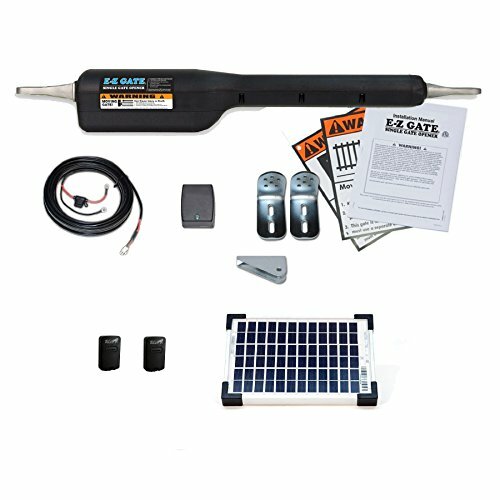 The description “solar dual swing gate opener” is misleading – this system is DC-powered, but charges using solar power. You’ll need to dig a trench during installation – a shallow trench is required in order to run the long cable through to the other post. If you have a concrete driveway, you may need some help or a jackhammer for the job. Push-to-open brackets are not included – the kit includes push-to-close brackets, which is good if your gate is configured as push-to-close. Otherwise, you’ll have to buy push-to-open brackets. For single-family use only – you can increase the duty cycles by upgrading to a 30W solar panel. Sliding gate openers rest on carrier rollers and have chains attached to a motor that pulls the gate to one side. CO-Z’s automatic sliding gate actuator operates in this manner. With its stainless steel build, it can pull a gate as heavy as 1400 pounds or up to 40 feet long. Like most sliding gate openers, CO-Z’s chain discreetly runs along the gate’s bottom section, giving the gate an overall minimalist look. 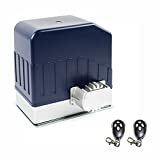 Decent quality for the price – it’s one of the cheapest sliding gate actuators that you will find, and it works as described! The motor is powerful for its size. Its housing is durable and sealed for weather-proofing. Very quiet motor – the only sounds that you will hear comes from the chain’s metallic jingling and the gate rolling, not the motor working. The noise level is less than 56dB, which is comparable to regular conversations at home. Two remote controls and two manual keys are included – you may add up to 23 more remotes to the system. The remote control has a good range – at least 100 feet as observed by users. You can program the gate to automatically close – you may set the gate to stay open for 12, 24, or 36 seconds, after which it automatically slides to close. Uses radio frequency hopping technology – an added security feature that prevents code interception. Installation instructions are not easy to understand – the manual leaves a lot of details out and incorrectly names parts. The instructions on the placement of the magnetic stoppers and installation of the chain are complicated. Does not work with HomeLink or other vehicle control systems – the only way to control it from the car is by remote control. Safety sensors are not included – sensors are a critical part of the gate’s safe operation for detecting pedestrians or obstructions, yet they’re not included in the kit. The chain is only 20 feet long – while the motor can handle gates up to 40 feet long, you’ll have to purchase a longer chain if your gate is over 20 feet long. You’ll need to build custom brackets – for mounting of the magnetic limiters. It’s not an issue if you’re skilled at workbench projects. USAutomatic’s Sentry 300 dual swing gate opener operates using linear arms. It is designed for ornamental iron gates, farm or ranch gates, and chain link gates not more than 20 feet long. Its maximum weight capacity is 400 pounds, but the maximum capacity varies for individual gates depending on gate type, materials, and length. Unlike Ghost Controls’ TDS2XP, it comes with a universal mounting bracket so that it will work for dual swing gates regardless of swing direction. It’s also available for single-swing gates up to 20 feet long. Two remote controls are included – other control accessories are sold separately. The remote control has relatively good range – 100 feet to 300 feet depending on the position of your antenna. Plug N Go feature makes installation easy and fast – components and wiring have been pre-installed. The only wirings you’ll have to connect are two wires that must be plugged to the positive and negative terminals of the battery. Sturdy build, weather-protected control board – the battery and electronic components stay dry even in bad weather. Has a stop and reverse function – this safety feature prevents damage or injury to people, car, pets, and livestock. Opens beyond 90 degrees – you’ll need this feature if you have a curved driveway. Can be customized for added functionality – you may add other Sentry products to upgrade it, including a gate lock, a photo eye sensor, a wireless keypad, or additional remote transmitters. The kit contains all the mounting hardware you’ll need – this includes wire nuts, 50 feet of cable, brackets, safety signs, and instructional DVD. The battery and solar panel are not included – the 110V AC transformer is included though. Can be noisy – it’s not excessively loud but not quiet either. The motor sounds almost like the whirr of an electric mixer. Has issues with needing frequent repairs – as the product approaches the end of its warranty coverage of 3 years, users notice frequent malfunctions requiring repair. Solar charging can be a problem – in regions with low solar radiation or during cloudy weather there’s a need for an alternate way to charge the batteries to avoid frequent failures. Not for high-volume traffic – its description says that it is designed for vehicular gate classes I, II, III, and IV, but won’t stand heavy use. The motor does not have a soft start or stop – the motor is strong, which is good, but has a jerky start and stop, which causes the gate to jump. Lowering its sensitivity may solve this issue but also reduces the sensor’s ability to detect obstructions. 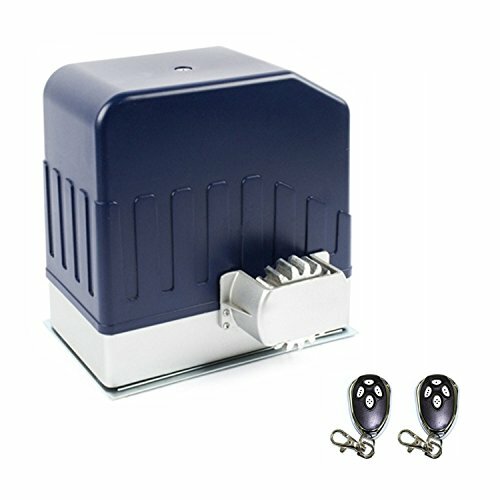 The sliding gate opener we’ve featured second in our list uses a chain to move the gate. Now we’ll tell you about Aleko’s AR1450NOR-M sliding gate actuator, which uses a mechanism called rack and pinion. The rack—a toothed bar or horizontal “gear”—is installed on the bottom frame member of the gate. The pinion—a circular gear—is mounted on the gate operator. When the motor starts, the pinion rotates and engages the rack. This system converts circular motion into linear motion and forces the gate to move. There’s a growing demand for rack and pinion sliding gates, and manufacturers fill the market with a variety of products of this type. 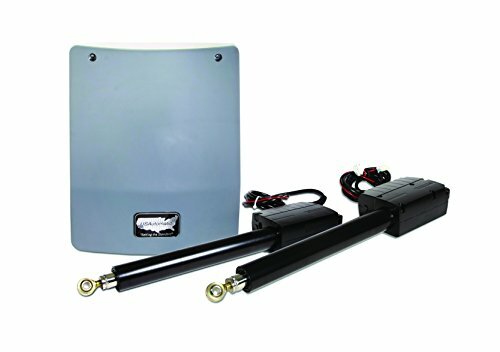 After diligently searching, we found AR1450NOR-M to be the best sliding gate opener in this category. Kit includes two remote controls and two manual keys – other accessories are sold separately. Strong motor – the 1.5-HP motor has a strong torque. Quieter than most chain-driven gate openers – operates at less than 56dB. The chassis is constructed of aluminum alloy – lightweight and rust-resistant. Its built-in receiver supports up to 100 remotes – you may upgrade with an additional external receiver to add beyond the 100 slots. Comes with magnetic stops – for setting the close and open limits. Has auto-close feature – you can set your gate to close behind you automatically. Good remote range – at least 100 feet but could be a lot farther without obstructions, like tall trees or structures. Uses RF hopping code technology – an added security feature to prevent hacking of your access codes. Supports stop and reverse function – you can purchase a photo eye sensor as an added safety feature to prevent the gate from crashing on obstructions. Requires little to no maintenance – once the rail is in place and running, you don’t need to oil it like you would with the chain design. The rack is not included in the kit – you’ll have to buy the rail separately, though some customers said that they received rails with their equipment. The manual is difficult to understand – the instructions could be better, but if you’re technically inclined, they’re quite easy to figure out. Installing is more complicated than in chain-driven sliding gates – the rail has to be the right height and must be level. Even a slight bend along the rail will affect the machine’s performance. No backup when there’s power outage – there are manual keys, though, which you can use to open and close the gate. After-sales service is not responsive – customer service is not efficient in addressing complaints and troubleshooting issues. Our Top 5 Best Gate Openers list wouldn’t be complete without talking about Mighty Mule. From its extensive lineup of gate operators, we’ve picked up the EZGO automatic opener for single swing gates. This kit includes a DC-powered single gate operator and all the hardware needed for installation. If most brands you’ve seen were designed only for certain types of gate, then Mighty Mule EZGO could be what you need. It’s designed for all gate types including vinyl, wood, and panel gates. Simple installation – does not require welding or the services of an electrician. Instructional DVD is included. Suitable for gates of different types – designed for tubular, chain link, ornamental, farm and ranch style, vinyl, wood, and panel gates. Two remote controls are included – other access control accessories are sold separately. Remote controls have a good range – at least 200 feet as observed by users. Compact and minimalist – the control board is built into the actuator’s arm. Kit contains all charging accessories – 10W solar panel and AC 110V transformer are included. Meets all the requirements of UL 325 and is ETL-listed – for use in gates categorized as Class I or for use by 1-to-4 families. Does not include the battery – a common complaint from buyers, though it’s clearly stated in the description that the battery is not included. Some buyers received incomplete kit – you’ll have to check the package right away, even when you plan to install the system later. Not good for gates almost 16 feet long – the actuator’s arm, which contains the motor, is rather short and struggles when operating gates close to the maximum length. You won’t find the “EZGO-Solar” model on Mighty Mule’s website – the product description highlights EZGO-Solar as the model name, which can be a problem if you need technical assistance. The correct model name is MM360. With due diligence, you’ll have no problem finding the right gate opener for your property. 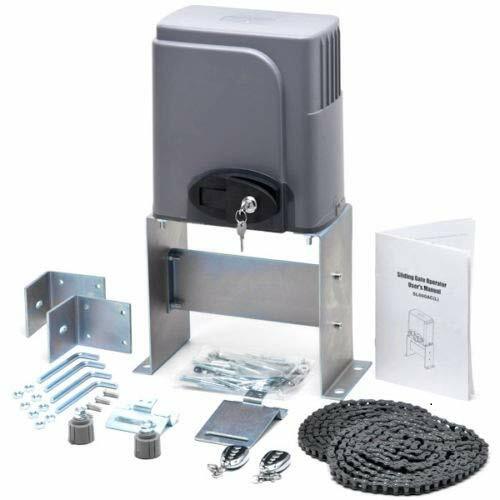 You must remember, though, that the presence of structural and mechanical weaknesses on the gate or supporting posts can cause undue stress on a gate opener. For swing gate openers, it is critical that the posts are strong and stable. For automatic sliding gate openers, it is important that the gate is aligned and level. So every time you inspect how your gate operators are holding up, also check how the gate and posts are performing. Just a heads-up though, you may follow every single recommendation from us and still find out later that even the best gate openers have their issues. That’s when you’ll realize just how crucial it is to buy from manufacturers who stand by their products. Fortunately, they’re not very difficult to find. You’ll know them by what their warranties offer and what the reviews say about their post-sales service. Good luck in your search! We hope we were able to help you.